I first came across Werner Pirchner’s music many years ago with the ECM double CD, EU. The particularly Austrian quirky wit and candid directness of those pieces has always stuck in the back of my mind, and so I was eager to hear what this collection of his piano trios would yield. Pirchner’s early years as a jazz musician are in evidence in the piano part of the First Piano Trio, with little flourishes of improvisatory gestures of unmistakeably jazz style popping out from time to time, though this is not really what I would call a ‘jazz’ work. Rhythmic character is a strength of the faster movements, but ‘heartfelt’ expression is also at the core of this piece. Pirchner can display a streak of sentimentality, but everything he does has a lightness of touch that avoids ego and any kind of wallowing. The Third Piano Trio with its themes of yesterday, today, and hope for the future, contrasts nostalgic reminiscence with more energetic liveliness with some nice jazzy touches. This is the “brightest and most carefree” of the three trios, though of course still filled with Pirchner’s expressive perspectives on life in all its aspects. Fun is tinged with regret perhaps, joy of life with an underlying sadness – always wrong-footing our expectations and never superficial despite those sparkly faux-naïve melodies. The program ends with an interview fragment from Hessian Radio in German which you may or may not be able to follow, but in any case it’s nice to hear Werner Pirchner’s good-humoured voice. 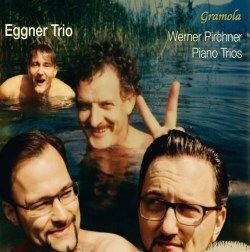 The Eggner brothers never met Pirchner in person, but the cleverly photoshopped picture of them sharing a dip with the composer on the cover is a nice touch. The recording is very much a studio production but has a good, well-balanced and natural sound without any apparent tinkering with acoustic effects. Re-acquainting myself with Werner Pirchner’s musical voice has reinforced my feeling of common ground with this uniquely individual artist. Our shared philosophy might be: make good stuff and enjoy life without worrying too much about what other people are doing or thinking. If you want some new and refreshingly honest chamber music, this is a great place to move off the beaten path.